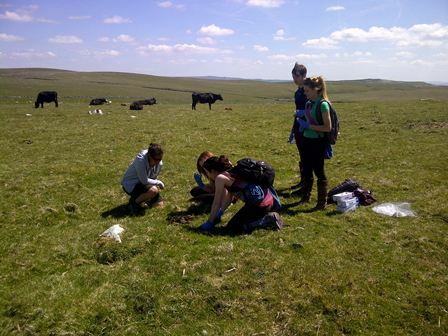 First year School of Life Sciences students are investigating the reproductive biology of golden dung flies, as part of a five day field course in Malham Tarn, North Yorkshire. The students, from Zoology and Biological Sciences undergraduate programmes, are introduced to a range of habitats and the kinds of skills fundamental to field biology; such as measuring species diversity, identifying plants and analysing water samples. Dr Zenobia Lewis, from the Institute of Integrative Biology, said: “One of the students’ tasks is to investigate the reproductive biology of golden dung flies. The male species fight on animal dung for access to females; the fights are so violent they sometimes drown the female in the dung by accident! 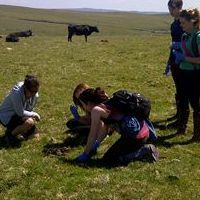 For the students the study involves them catching the males from the surface of the dung. “This field course is a fantastic opportunity for the students to get hands on experience of some of the concepts they have been learning about in their lectures over the course of their first year. The dung fly investigation is particularly apt, as University of Liverpool is world famous for its reproductive ecology research.